BERLIN, Germany -- German Chancellor Angela Merkel on Tuesday urged Russian President Vladimir Putin to use his influence to rein in pro-Kremlin rebels in eastern Ukraine, a day after she warned a year-old peace deal was not being fully implemented. 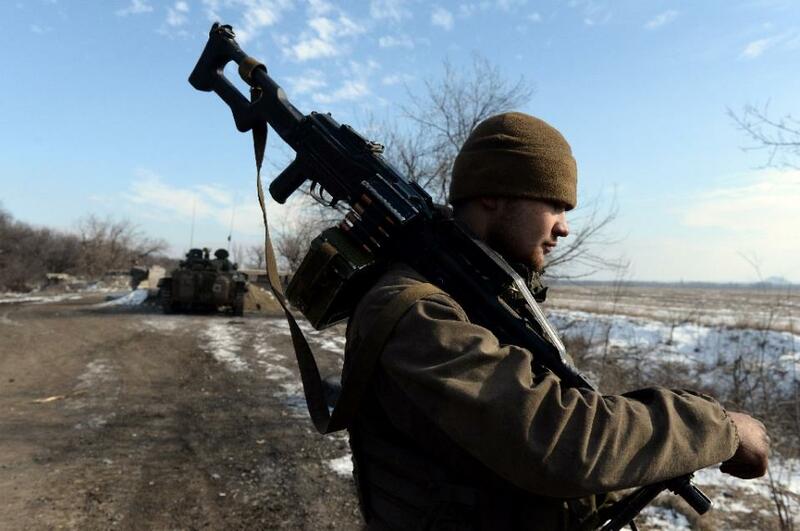 Pro-Russian rebels guard a checkpoint near Uglegorsk, east Ukraine. During a phone call, Merkel "made it clear to President Putin that in order to obtain further progress towards a comprehensive political solution", the ceasefire between Ukrainian government forces and the rebels had to be respected and observers monitoring the truce given unfettered access. In Moscow, the Kremlin said Merkel and Putin discussed issues related to the implementation of constitutional reforms in Ukraine and the holding of local elections in the breakaway regions of Donetsk and Luhansk "based on legislation agreed with representatives" of the two self-proclaimed rebel republics. "Mutual interest has been expressed in securing a stable ceasefire," the Kremlin said, adding that a meeting of foreign ministers from Russia, Ukraine, Germany and France -- the four countries involved in last year's peace talks -- was planned "in the coming days". The conversation came a day after Ukraine's President Petro Poroshenko, speaking after talks with Merkel in Berlin, accused Russia of continuing to send troops and weapons across the border into the ex-Soviet country in violation of the ceasefire deal. Merkel also noted that "unfortunately we still, as before, do not have a sustainable ceasefire". The truce brokered by France and Germany in the Belarus capital of Minsk in February 2015 lead to a marked decline in the fighting in eastern Ukraine but sporadic clashes still take place along the frontline. Poroshenko blamed "Russia and its proxies" for the violence, accusing them of being responsible for 1,200 shellings in January alone. Kiev and the West have accused Russia of supporting the insurgency militarily. Putin has repeatedly denied playing any direct role in a war that began less in April 2014, than two months after the ouster of Ukraine's Kremlin-backed president Viktor Yanukovych. More than 9,100 people have been killed and 20,000 injured in the conflict, according to the United Nations.